How many times in our lifetimes have we encountered a difficult stretch and wondered aloud if it was ever going to end, asking for a sign from above to give us hope? How many times do people turn to fortune-tellers, good luck charms, psychics or horoscopes for a hint of the future? Would we even know a divination sign if we saw one? Humans are supposedly the only creatures capable of rational thought. Rational thought is analytical: identify, quantify, specify. During our lifetimes, we absorb a tremendous amount of information and we use that information to make decisions. We can take events from our past, remember the outcomes, and use that knowledge to make an informed decision. In most cases, past outcomes become the basis to determine the most probable outcome for a future event. Most probable, however, is not an absolute certainty. Unknown or highly unlikely outcomes called “Black Swan” events can arise, sometimes favorable, sometimes not. For example, matching all the numbers in a huge jackpot lottery on one ticket is highly unlikely, usually in excess of 120,000,000:1. A four-leaf clover is supposedly lucky, so why didn’t I select the winning MegaMillions numbers on my ticket? The day after the drawing, I found I had matched one number. Unfortunately, it was not enough to win anything. My friend fared worse by not matching a single number. So much for using a good luck charm to forecast the future. 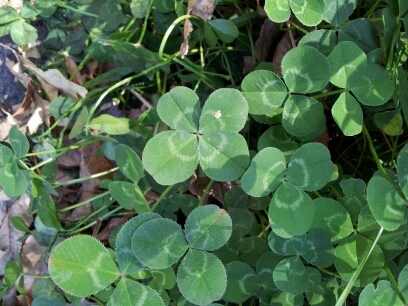 The odds of winning the MegaMillions lottery with one ticket is 258,890,850:1, or roughly 2,589 times as rare as finding a four-leaf clover. I saw several people carrying a lucky rabbit’s foot buying lottery tickets. How can a rabbit’s foot be lucky because it came off an animal after an unlucky event? Other animals have fared poorly in our quest for divining the Divine. Goat livers or chicken entrails, anyone? At least other divination items like crystals look nice and brewed tea leaves is a healthy beverage. Weather forecasting is seemingly a 50/50 proposition when projecting out over a week. Many people with a minimum of weather watching experience can predict if tomorrow is warmer, colder, or wetter than today. Those same people are unable to predict tomorrow’s temperature to within 3°F accuracy or precipitation within 0.1″. For most of us, a general guide to tomorrow’s weather is enough. Some occupations require accurate weather for ten days in the future. Certain types of concrete can handle small amounts of precipitation falling while curing; too much rain can damage or destroy it. Using a crane is not advisable during high winds. Planting crops before the final frost of the season will seriously influence harvest yield. Weather very much affects farmers. A growing season stretches out over several months and a crop destroyed by an unexpected frost or torrential rain is a substantial loss of time and money. Weather folklore came about through thousands of years of observations and noticing certain natural phenomena. Some folklore roots are more wishful thinking (or wistful thinking if the year’s crop lies in ruins) rather than solid observation. In the Upper Midwest, woolly bear caterpillar stripe size is supposedly a harbinger of the upcoming winter. Woolly bear caterpillars eventually metamorphose into Isabella tiger moths, not meteorologists. Another forecasting myth involves the groundhog. If the groundhog sees its shadow on Groundhog’s Day (February 2, exactly the halfway point between winter and spring), six more weeks of wintry weather should occur. With an accuracy of less than 40%, which is worse than the expected 50% of pure chance, perhaps the groundhog is better suited for predicting winning lottery numbers. 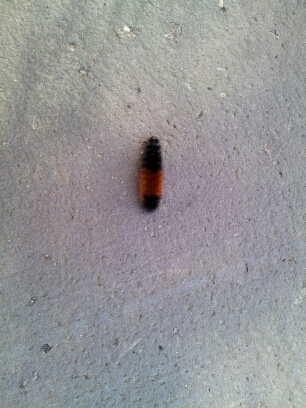 Does this sort of stripe on a woolly bear mean a mild or frigid winter? Remember that humans are mostly rational thinkers when they are not distracted with associating completely unrelated events into a prediction tool (see “woolly bear caterpillar” above). Accurately spotting future trends is a holy grail humanity has sought for millennia. Economic forecasts, actuarial tables, weather forecasts, and lottery number picks all strive for accuracy. Some of the supposed economic forecast signs are which team wins the Super Bowl, women’s skirt lengths, men’s underwear purchases (men choosing to “go command” must skew the data), and during the period when Alan Greenspan headed up the Federal Reserve Bank, the thickness or thinness of his briefcase. 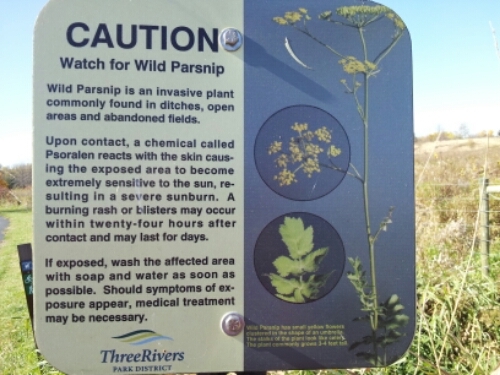 Even though no wild parsnip is presently in the park preserve, there is a warning sign because wild parsnip spreads quickly. There is no known infiltration of wild parsnip in the park. It does spread quickly and may appear in the near future. If people see the warning often enough, the hope is they will avoid contact with wild parsnip if or when it appears in the future. Perhaps the best harbinger of future events is being in the present moment. Decisions made in the present influence the future. While we cannot change the past, we might change the future by being aware of the past and applying that knowledge to the present. It beats slaughtering a goat or maiming a rabbit. Be flexible with your plans because Black Swan events can and do happen. Have a good support team in place to help you through the rough times and enjoy the good times; be prepared to do the same for them. Those of you who have a special someone in your life have won a lottery with odds exceeding 7,000,000,000:1. You have found the one person on this planet right for you, a person who makes you smile and laugh, who brightens your day when times are dark, someone whom you unquestionably trust, who supports your dreams, celebrates your victories, dries your tears and calms your fears. That is a prize more valuable than a nine-figure jackpot. Give that person a meaningful hug and I will make a 100% accurate prediction for the future: you both will smile and feel content every time it happens. What a de-leaf it is! One of the more spectacular autumn color displays in recent memory is closing. I can tell this by the piles of leaves dropping off the trees at night. The two apple trees still have most of their leaves on them, but the other trees in the yard are mostly to totally bare. Several hours of raking and shredding leaves yielded twenty heavy 30-gallon bags of yard waste. Within three hours, the wind direction shifted and the wind speed picked up. The really tall silver maples in my neighbor’s yards are shedding leaves and I am receiving most of them. Yard work has been daily since last Thursday and will remain a daily chore until next weekend. Losing leaves exposes all the bird nests built this year. The small Autumn Blaze maple hosted three goldfinch nests, the ash in the back yard had an oriole nest and several robin nests, and the burning bush had a cardinal nest tucked away. If this year is like previous years, the forsythia should have several chickadee and wren nests in it. There are still a few flowers in the garden, mostly hardy chrysanthemums. The dahlias that I thought had died in the first frost rebounded and still have blooms on them. A pot of petunias and some rejuvenated pansies add some color, and the blanket flowers around the mailbox are blooming strong. One addition I am planning for next year’s garden is a New England aster. It will add some purple to go with all the yellow flowers common this time of year. Even the weather has cooperated so far. There have been several light frosts but the temperature quickly warms up. By this time last year, there was snow on the ground and it stuck around until May. This year has had temperatures at or slightly above normal. Any precipitation that will fall for the next week will be liquid and not solid. After a Goldilocks “just right” run of delightful weather, the Twin Cities area is cashing its reality check. The past week has seen below average temperatures and dreariness reminiscent of late November rather than early October. I know there are birds still around, but the past couple of days have been extremely windy. The high winds are causing the trees here to sway like brightly dressed drunken revelers trying to dance (or stagger) a conga line, with some of the trees stripped bare. Watching crows fly backwards and then doing loops is always an odd sight, but they seem to take delight in the wind caused acrobatics. The slate gray sky mutes the colors on the trees until the sun peeks through a break in the clouds to brighten things up. There are many clues that the seasonal roller coaster ride has begun again. There are different smells in the air. Furnaces are waking after a long slumber and the indoor air has a hint of burnt dust odor for the first few runs. Fireplaces are crackling and the neighborhood air smells like wood smoke. The people lucky enough to burn birch have a warm house and the outside air has a wonderful smell. There is a different feel in the air. Office buildings that were uncomfortably warm are now chilly as the HVAC system starts its several day switch over from air conditioning to heat. Open-toed shoes, shorts and tank tops are spending more time in closets and lightweight jacket sightings are more commonplace. The mornings start out still and chilly and the afternoons end up mostly sunny and windy. Temperature swings of 30°F or more are common. There are different tastes available now. Nearly every dining establishment and coffee-house has pumpkin flavored items on the menu. To be accurate, the pumpkin flavoring is artificial in most cases, a witch’s brew of organic chemicals that fake out the taste buds. Like the current bacon craze, pumpkin is showing up in everything but gasoline and laundry soap, though those two staples are probably healthier to consume. Apple harvest is underway and cinnamon scent wafts from bakeries. Even the sounds of the season change. Apartment complexes with boilers and radiators hear the thud of water hammer until the system purges the air from the lines. Windows spend more time closed than open muffling the sounds. Convertibles blaring loud music and motorcycles with loud exhaust systems stay in garages longer. High school football game sounds carry for several miles from the field of play with cheering and music. Beaches are silent but shopping malls are busier. Dried leaves crunch underfoot and leaf piles become tempting frolicking targets for children and young-at-heart adults. Couples enjoy the cooler weather. An outbreak of cuddling started recently and probably will not abate until the heat and humidity of next summer arrive. Unlike the flu or the common cold, many people would prefer a case of the cuddles. Cuddling is contagious, but it has health benefits including stress and anxiety reduction. If you have a special someone, enjoy some cuddling time whenever possible. It beats sneezing and wheezing and it will help you manage the seasonal roller coaster ride.